When my parents lived in Oklahoma City, I flew out to visit and join them for a week-long road trip through Oklahoma into Texas. Our destination was San Antonio, and we marveled at the geography, so different from New Jersey and the East Coast, where they (and I) had lived our entire lives. The bat caves fascinated us the most, until we ran into a different kind of creature the next day. After walking in the dark through all that guano, we drove to Austin and, by surprise, found the newly opened LBJ Library. We entered the beautiful foyer, amazed that no one else was there. The rooms were spanking brand new, the replications of the Oval Office and the Blue Room, spectacular. As we entered another hallway, my dad pointed to a wax human-sized replica and said, “Pammy, say hi to Lady Bird Johnson.” I approached the wax figure with a smile, a proffered hand, and said joyfully, “Hiya! My name is Pamela Wight.” The figure moved, smiled, and then I was surrounded by five black-suited men. They were secret service agents. The wax figure was real, and Lady Bird Johnson was on a tour of the (whoops, not opened-for-the-public) library. We were escorted out none-too-gently, and Lady Bird never did shake hands with me. Last Friday night my guy and I decided to have a ‘date night’ at a local bar. The restaurant is fancy, but we prefer to sneak into a smaller back room, decorated in old pine with a curving bar and a half dozen small round tables strewn about for seating. We always just cozy up on a barstool and talk with the bartender, who pours our glasses of wine as soon as we enter the room. This evening, as we walked straight to “our” seats at the end of the bar, I noticed a nice-looking man hunched over a Kindle, sipping on a beer as he concentrated on what he was reading. 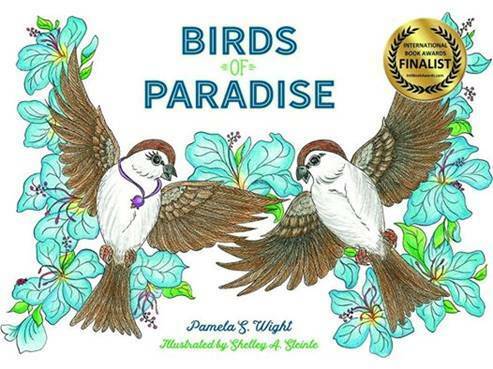 Thinking nothing of it, I sat down, took a dainty sip of my wine, but then suddenly the Kindle was plopped down in front of me, and the man said, “Pam Wight? Look what I’m reading.” He was on the third chapter of my book, The Right Wrong Man. 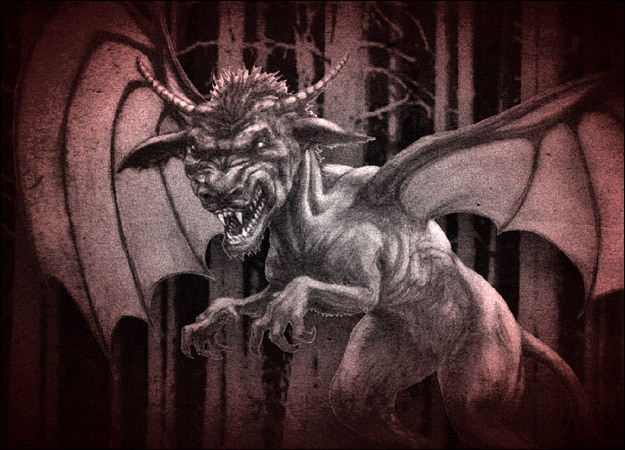 Growing up in New Jersey, I was raised on the legend of the “New Jersey Devil.” He preyed on teenagers and lived in the Pine Barrens, a heavily forested area of coastal plain that leads to the ocean. Even though we teens were well aware that we had to drive through the Barrens to reach the beach – our most popular destination on a summer’s day – we did it weekly. One August, three of us spent too long sunning ourselves, so we didn’t begin our hour-long journey back home until after dark. Jonathan, our designated driver, cried out “uh oh’”about 20 minutes into the ride – his old orange Rambler was almost out of gas. The 2-lane country road we traveled was dark as sin, no street lights, and the sky was starless. As the engine began to thump thump thump, Jonathan pulled his car onto a long dark driveway and said, “Pam, you and Skip go knock on the door of that house and ask if they have a can of gas.” Young and stupid, we agreed. As we held hands and tiptoed across the pebbled road, we heard a screeching roar, and two humungous golden horns gleamed as the moon suddenly appeared from the clouds. We screamed so loudly we both lost our voices, ran back, pounding on the car doors until Jonathan unlocked them. The lights of the house blinked on; the police were called. They scoured the neighborhood and ran into two rutting male deer, who were fighting over a doe. THAT’S IT! WHICH STORY DO YOU THINK DIDN’T HAPPEN? OK Pam, you’re a good writer,I really dickered between story 1 and story 3 as being the false one.At first I decided they were all plausible and you were just putting us off with the story that one tale was a fabriction, then I decided you wouldn’t do that. In the end I settled for the last story as being the wrong one.I couldn’t see Jonathan running out of gas with two females along, it would only work with one (see Thriller) and though the story of the rutting stags is good I don’t see the horns as humongous or golden. Thank you for making a guess. Is it right? The answer appears on Friday. Sorry to jump on board with everyone else but I believe #3 to be the false story, too, Pam. I believe the legend of the New Jersey Devil is true, we had a similar legend in the remote part of town I grew up in. I believe a young guy would send a young woman out into the dark (sadly). I think you spun a great story with these truths to create a nice piece of fiction. BTW – love #2…awesome timing! I’m thrilled that you think #2 is true. 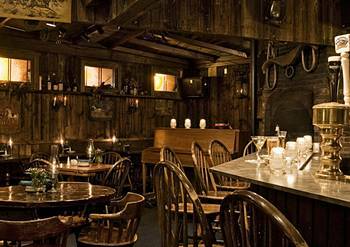 A man, a bar, and a romantic suspense novel. I think that should be the beginning of a book…! The ‘true’ answer will be revealed on Friday. Most often, fiction is never as strange and as unbelievable as the truth!! I question both 1 and 3. If the library was empty (no mention of cars), why would Lady Bird Johnson be there with 5 secret service and posing as herself. Surely there would have been company cars. And, I though only one-two sercret service detail are assigned to a former president and spouse. But, the last story made me wonder. Why would a boy not have enough gas for the car, run out in a creepy area, send two girls knowing on a door,etc. And yes, rutting season doesn’t occurs in October and November, not summer. The story is dramatic and sounds like pure fiction. I like the way you ponder the details and pose the questions of what is true, and what must be false. Are you correct?? Find out on Friday, when I come clean with the truth. I think it’s number three as well, but with your talent around a story I can’t be 100% certain. Number three it is, though. Ah, you’re guessing the false story based on romantic deer. Hmmm, that’s clever, and cute. 🙂 I’ll reveal which two stories are absolutely true. As absolute as a story can be…!! What fun! I, too, questioned #1 because I couldn’t imagine how they let you get in there in the first place, so I’ll go with that one. My first thought about #3 was that it was too deliciously detailed to have been made up, but then I forgot who the writer was… :-). I’ll still stick with #1 as the false story just to be contrary. By the way, #2 was really cool…and I wanted to tell you that if you haven’t been back to the LBJ Library, it is fabulous. We went a couple of years ago when we were visiting our son in Austin, TX. The other “must see” in Austin is the Lady Bird Johnson Wildflower Center. I’d love to go back to the LBJ Library (that is, of course, if I ever went there at all…) as well as see the Wildflower Center. Austin is on my bucket list. Hmm… this one was a bit difficult but I have to agree with almost everyone else. It is #3 because of the deer. Mating season is not in the summer. And I agree also that your friend would not send you into the dark to get help. #2 ~ if he was engrossed in the story, he wouldn’t have connected the dots to recognize you sitting at the bar just moments after you arrived. And if he wasn’t engrossed in the story, he would have pretended not to recognize you. Ha ha. What a great answer! But is it correct??? 🙂 The truth will be posted on Friday. Um, have YOU ever come face to face with a maniacal (violently romantic) deer??? You may be right, or you may be very very wrong. Find out on Friday! I agree with all the above reasoning, but number two, which if true, could not happen since your picture wasn’t available for him to see while reading a kindle unlike a book. Are you going to share which is true and false? I think #1 is the false one. If you flew out to visit your parents to do the trip with them you would have been living on your own someplace else, so that would make you a young adult. But LBJ wasn’t president after 1969, so at that time, you would have been too young to be asking to shake Lady Bird’s hand at that time. I’m so glad you keep me young at 1969. THANK YOU!! 🙂 But the answer may be more complicated… is it? Check out my answers on Friday. I have to go with Nr 2 because I don’t think the kindle has a picture of the author, although I am not sure. As for Nr 3 , years ago my then young husband ran out of gas on the way to Los Angeles with three girls in the car ( I was one of them) . The poor guy had to walk some miles before he returned with some gasoline. I also could br Nr 1 because wouldn’t lady Bird want shake the hand of a young girl. You are a wonderful writer and stories number 1 and 3 have the feel of stories that are true and told over and over again. They are strange enough to be true and provide fodder for many a laugh when “story-swap” time is upon you. Number 2…that one is a story I wish I could tell as a writer and, for your sake, I hope it’s true. I just don’t think it is. You present him as someone you don’t know (“a nice-looking man”). He’s reading a Kindle, so how would a stranger recognize you (no author photo on the cover of a Kindle book)? Finally, he appears to be fascinated with the story (as I’m sure I would be with such a well-written romantic thriller–my favorite genre and apparently his, too because he is reading a Kindle in a bar by himself and he’s nice-looking–something wrong with that picture right there! ), so why would he notice you when you were so unobtrusive? Yup. #2 is false. I hung on to every word you wrote here in your guess. What a well-written reason on why #2 must be false. But are you right?????????? Hmmm. We’ll find out on Friday. I thank you for hoping that #2 is TRUE. Or is it just a romantic notion? Check out the truth on Friday’s post. The second thing I noted is that you walked in “all that guano” which is bat manure and can be quite dangerous. I don’t believe tourists are permitted to walk in bat droppings due to possibility of inhaling histoplasmosis spores which can be a deadly and difficult fungal disease to treat. There is also the possibility of acquiring rabies by inhalation and that has happened here in one Texas cave. But if No 1 is true then you and your folks sure took a chance by walking in bat manure and maybe that part of the story was the only part not true. Third the museum would not have an open door for anyone to enter if it had not yet been opened to the public. Your last story sounds fictitious but you later admitted that that it was two bucks fighting but it is also possible that the deer were in rut if it was late August. The golden horns could have merely been a hysterical reaction by two girls who were scared out of their wits. I think it is story number 2. As writers we would all love this to happen, but it only happens in our dreams. It is unlikely a man would be reading a Kindle in a bar while having a beer, and how would he know who you were. All the stories are great. I love this game!! Thank you for your guess, Darlene. ‘Only in our dreams’ – but do dreams sometime become reality??? Find out in my Friday post. That is so awesome it happened to you!! A great story and even better because it is true! Number one is false. The biggest hesitation here is how you would come up with this story if it was false. Who thinks about a visit to the LBJ Library unless they were actually there? Maybe, afer everything Lady Bird had been through wtih LBJ, she appeared like a wax figure, but there’s something that doesn’t fit. So there. Number one is false. Ah, guessed like the true political realist that you are. I think that #2 is false, only because it seems too real! I HOPE it was true, though. The first one was an amazing story which is so bizarre it MUST be real, Pam! The last one is also crazy but possible, so I think it should be turned into an extended short story. I’d love to write an extended short story about the New Jersey Devil! Oh how we teenagers came up with some truly scary stuff around him/it. Thanks for hoping that #2 is real. You can find out in my Friday post. Hmm, I actually hope they’re all real, as they’re such great stories! I go for number 3, not for any real reason except it’s just like a horror movie I’d watch! Okay Andrea – thanks for playing the game and guessing #3; is the horror story a real horror??? 🙂 The (scary?) truth will be posted on Friday. I’m guessing #3 is false because American Motors didn’t make an orange Rambler! Since I already have a copy of your book (and have read it of course!) you can give the prize to the runner-up. Look forward to the answer next week! This is so fun. I enjoyed this game on Vanessa’s blog, too. I want #2 to be true (that would be amazing! ), so I’m going with #1 — I’m not sure how you could have gotten into the building in the first place if it was closed to the public, or that you’d have wandered around for that much before anyone “nabbed” you. I choose number 3 because rutting season for deer is in the fall. I know someone already said that! And you know your deer! Check in to the answers tomorrow. No idea Pam but love the stories. FINALLY I’ve made it here! Thank you for giving me a shout out at the start! I managed to come straight here without reading your answer post because I wanted to actually play (Even though I know I’m too late for the prize!). I’ve also avoided reading the other comments in this thread too so as not to be swayed! It’s tricky because all three of the stories are written well, they all sound generally believable, but all three also have a bit in them which doesn’t quite ring true for me! I’m going to settle on the first one as being the untrue one though, I just don’t quite buy that they would be standing so still, and alone, right up until after you approached, extended your hand and spoke, especially considering your Dad had said something first which would have elicited some reaction I feel.